So happy that spring is here. Farmers markets are cranking back up and a whole new crop of fruits and vegetables are arriving. For this month’s Recipe Redux theme of “First Shoots of Spring” I chose asparagus. Asparagus is one vegetable that I did not start eating until after college. I don’t know if I suddenly developed a taste for it or if I finally had it prepared properly. Cooked too long, it can quickly turn to mush. But I now love asparagus. Unfortunately my husband does not. So I do not prepare it that often but when I do I usually just roast it in the oven. So simple and delicious with a tender crunch and subtle sweetness. Inspired by the drizzly cooler weather we have been having lately, I decided soup was in order. I am currently dairy and soy free so while a creamy soup is what I had in mind, it isn’t something I can eat. By using potato and avocado in the recipe, I got the creamy texture that I wanted, not to mention a boost in flavor and nutrients! My 3 year old told me after trying it “Mommy, this is yummy! Thank you for making it.” I still am beaming from the compliment. My husband even ate a bowl. 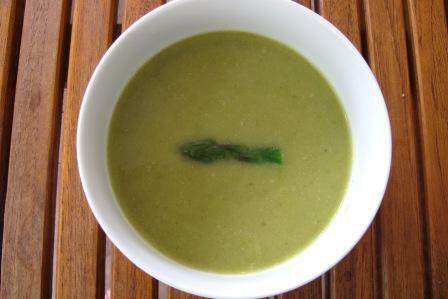 While I did serve the soup hot, I think it would work really well as a chilled soup too. Heat olive oil in a stock pot. Add onion and garlic and cook until softened, about 5 minutes. Add asparagus pieces (except for the tips), potato and the chicken stock. Bring to a boil and then simmer for 10-15 minutes until the asparagus and potato are tender. While the soup is simmering, blanch the asparagus tips and then plunge in cold water to stop the cooking. Set aside. 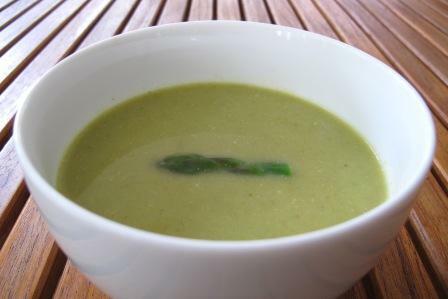 Add the avocado to the soup and puree with an immersion blender or in batches in a blender. Stir in the lemon juice, thyme, salt and pepper. Serve in bowls and garnish with the chopped basil and asparagus tips.